Check-in time is 5:30 p.m. on your day of arrival; check-out is 10:00 a.m. on the day of departure (all times are local). Your flight to Ketchikan must arrive prior to 5:00 p.m. Your 10:00 a.m. departure will enable you to catch a 12 p.m. (or later) Alaska Airlines flight from Ketchikan. You will need to arrive in Ketchikan by 5:00 p.m. if you want to reach the lodge that evening. Recommended flights from Seattle are #789, which arrives in Ketchikan about 3:00 p.m. or #67 which arrives about 4:30 p.m. Do NOT take Alaska Airlines flight #69 which arrives about 7:30 p.m., as we cannot get you to the lodge that night. If you find it necessary to take this flight, you will need to overnight in Ketchikan. Due to the high possibility of early morning fog, we recommend that you do not depart on Alaska Airlines flight #60 that leaves Ketchikan about 9:45 a.m. If it is necessary, we can usually assist you in getting back to Ketchikan to take that flight; however, it may require leaving the lodge as early as 5:00 a.m. Depending on occupancy, it may be possible to accommodate early check-in or late check-out to allow for additional fishing opportunities, beyond your booked reservations. Fishing rates outside your normal stay are as follows: half-day (fewer than four hours) is $400/person; full-day (up to 9 hours) is $800/person. Please let our reservationist know of any special arrival or departure needs and any extra fishing time desired. With accommodations for up to 19 guests, Boardwalk is the perfect family or corporate retreat. Call our business office at 800-764-3918 for special rates and availability for private and exclusive lodge bookings. Alaska’s Boardwalk Lodge affords a 20% rate reduction for your non-fishing partner ($250 per day boat fee applies if used). Youth 14 years of age and under receive a 25% discount; ages 15-17 receive a 15% discount. Children under 10 may accompany an adult with the lodge manger’s permission. 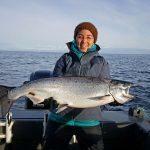 Trips are available for both fishing excursions and flight seeing adventures at an additional cost. Rates vary depending on destination and number of guests. Please call for details. A $1000 deposit per person is due within 10 days of reservation to confirm and hold the reservation. A second deposit equal to 50% of the total package price is due by 1 February, with the balance due 1 April. For reservations made after 1 February, 50% of the total package price is due within 10 days to confirm and hold your reservation. Balance is due 90 days prior to arrival. Both Visa and MasterCard are gladly accepted for all lodge transactions. If it is necessary for a trip to be cancelled, monies already paid will be rolled over to a future season if the cancellation notice is received at least 90 days prior to the date of the trip. However, monies paid toward a trip will not be refunded. While not mandatory, the Lodge strongly advises that you obtain trip insurance. Boardwalk Lodge cannot be responsible for loss of fishing time, lodging, flight delays, or any changes to the trip incurred due to weather conditions or other factors beyond its control. Information regarding this insurance is available on request.